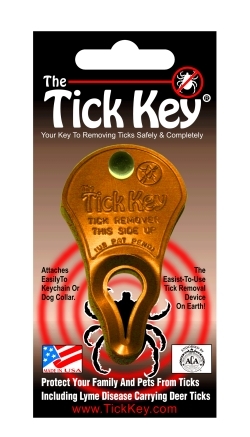 Easiest-To-Use tick removal tool for people and pets. Effective on all types and sizes of ticks. A Must for all outdoor activities. As seen on Good Morning America's "Best Pet Products of 2009". Discounts are on each Tick Key and appear in cart at checkout. Interested in getting your message engraved on Tick Keys? 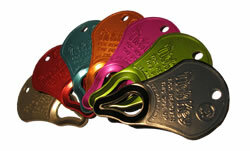 Free engraving is offered with a minimum purchase of 50 keys! Click here to choose custom engraved Tick Keys." Tick Key is the Easiest-To-Use tick removal product on the market and is designed for people, dogs, cats, horses, etc. Effective on all types and sizes of ticks. Made from 5051 quality aluminum with anodized coating for durability. The Tick Key is flat and is easily stored in a wallet, pocket, or on a key chain. slot. Pull key up from skin. The Tick is removed easily, head and all! 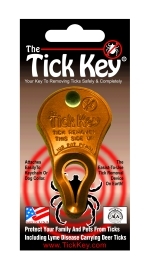 It is the only tick removal device available that uses natural forward leverage to remove the entire tick, head and all, quickly and safely without touching or squishing even the toughest engorged ticks. This patented design has been perfected and tested for over five years and has removed thousands of ticks of all sizes including deer ticks and dog ticks. It is fabricated from high-strength anodized aluminum, is currently available in 7 bright metallic colors, is flat and easily stored in a wallet, pocket, on a key chain, collar, saddle, or leash. In many cases a tick is likely to be carrying pathogens such as lyme disease,ehrlichiosis and others that are harmful to humans and pets. Tick saliva or blood is something you do not want to risk being on your hands or under your fingernails. 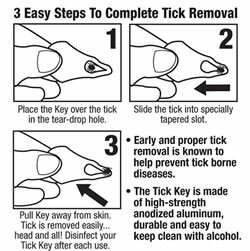 Pulling on a tick, even with tweezers, can tear the mouth parts from the body of the tick leaving them embedded in the wound causing risk of secondary infections. This can force spirochete and other infective body fluids through the mouth parts of the tick and into the wound site increasing the risk of infectious diseases. Applying any substances, such as petroleum jelly, fingernail polish remover, repellents, or a lighted match that upset or harm the tick almost always cause the tick to vomit the contents of its stomach back into the host. No matter how badly a tick may want to remove itself, it is not capable of doing so quickly. Ticks can live without air for long periods; attempts to smother it can allow disease transmission for hours.